A coalition of Southern California and Central Valley labor groups plans to spend $2.5 million over the next three weeks on a coordinated, Spanish language multi-media campaign to boost turnout among occasional Latino voters for the Nov. 2 election. Led by Maria Elena Durazo, executive secretary-treasurer of the L.A. County Federation of Labor, and former Speaker Fabian Nunez, the group has invited Spanish language news organizations to a press conference today to unveil details of the program, which includes TV advertising, a direct mail effort and a get-out-the-vote operation. Based on the slogan “Martes (Tuesday), si, Arizona, no” the campaign uses the specter of Arizona’s controversial law targeting illegal immigrants as a pitch for Latinos to vote because “Los republicanos quieren traer la ley de Arizona a California” – Republicans want to bring Arizona’s law to California. Although the group is operating independently of Jerry Brown’s campaign, their effort strongly attacks his GOP rival Meg Whitman. One mail piece places her photo alongside shots of Sarah Palin and Arizona Governor Jan Brewer; above a headline on another piece reads, “Meg Whitman ayudo a Sarah Palin y Sarah Palin* apoyo la ley de Arizona” – Whitman helped Palin, who supports Arizona’s law. 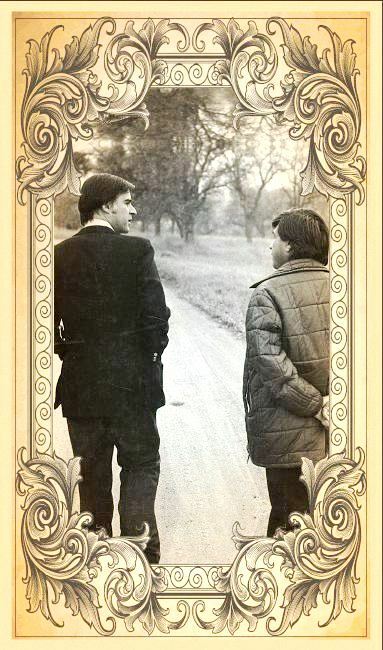 The letter is to be folded around one of several holy cards – one of them features a photo of a young Brown walking with Cesar Chavez and another has an image of him speaking to Mother Teresa; each includes an inscription saying that “El democrata Jerry Brown ayudo” Chavez and Mother Teresa – the Democrat helped the two Latino community icons. The voter turnout campaign is being managed by consultant Richie Ross, who said it is based on focus group and polling research of “occasional Latino voters,” defined as those who did not vote in the 2006 election for governor, but did vote in the February 2008 Democratic primary battle between Hillary Clinton and Barack Obama. The campaign is being financed jointly by the L.A. labor group, the San Diego and Imperial Counties Labor Council and political committees controlled by Nunez and by Democratic state Senator Dean Florez, who represents a large swath of the Central Valley. It targets 500,000 households, with a goal of bringing an additional 200,000 Latino voters to the polls. –A 30-second spot that cuts between images of protests against the Arizona law and campaign leaders Durazo and Nunez saying directly into the camera that Republicans are attacking schools and families, and that Latinos should vote to prevent Arizona-style legislation in California. –A series of mail pieces, to include two posters, two postcards and Durazo’s letter with the holy cards inserted. 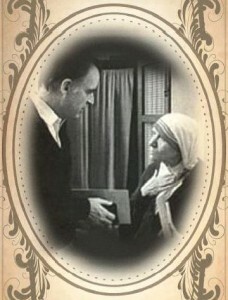 One of the postcards shows a photo of a triumphant Whitman laughing with fists clenched and arms raised: “Nunca!” reads a large headline – Never! 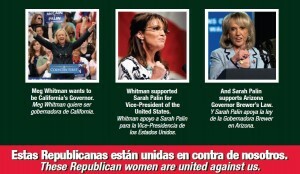 One of posters pictures Whitman, Palin and Brewer over a headline that reads, “Estas Republicanas estan unidas en contra de nosotros” – These Republican women are united against us. –A labor-backed ground operation that includes phone banking and door-to-door organizing in L.A., San Diego, Imperial and Central Valley counties. Latinos represent about one-third of California’s adult population, but only about 18 percent of likely voters, according to a study released last month by the Public Policy Institute of California. PPIC reported that about 65 percent are registered Democrats, 18 percent Republicans and 14 percent decline-to-state independents, and that about 75 percent live in Southern California or the Central Valley. The labor group’s goal of bringing an additional 200,000 Latino voters to the polls, if successful, could represent as much as 3-4 percent of the November electorate, depending on overall turnout, a number that could be determinative in the tight Whitman-Brown race. The 500,000 households were targeted after focus groups, conducted in June, that included second and third generation Latinos as well as more recently arrived citizens and that focused on discussions of the Arizona law. A poll, including 600 Latino respondents defined as occasional voters, followed in July. As described by Ross, the findings showed that 93 percent of those surveyed had heard of the Arizona law, 86 percent opposed it and 73 percent believe a similar law can occur in California. The research for the campaign was done months before the story broke about Nicky Diaz, Whitman’s undocumented housekeeper, and none of the campaign materials refer to that controversy. P.S. Harold Meyerson has a good take on the importance of Latino turnout here. *Department of Corrections: In an early version of this post, we mistakenly omitted the second use of Palin’s name in the Spanish text of the mailer, which confused the meaning of the sentence. The mailer reads: “Meg Whitman ayudo a Sarah Palin, y Sarah Palin apoyo la ley de Arizona.” Translation: Meg Whitman helped Sarah Palin, who supports Arizona’s law. Sorry for the confusion. It says “y apoyó la ley” meaning “and supported the law,’ ie Whitman herself supported it. I really want one of those holy cards. Do you think they’ll turn up on eBay? I want one too. Especially because they show Brown with hair. True antiques! Good catch – the Buzzards just posted this clarification: In an early version of this post, we mistakenly omitted the second use of Palin’s name in the Spanish text of the mailer, which confused the meaning of the sentence. The mailer reads: “Meg Whitman ayudo a Sarah Palin, y Sarah Palin apoyo la ley de Arizona.” Translation: Meg Whitman helped Sarah Palin, who supports Arizona’s law. Sorry for the confusion. I’m sympathetic, but even though I have “command” of the Spanish language, having lived in Latin America for the larger part of my mispent youth, I would much rather see a ballot in my native tongue, especially when there are confusing initiatives on it. I think it makes for at least slightly better voting. So I wouldn’t call that tragic. The anemic voting patterns are truly tragic. If everyone who could vote did vote there simply would be no Republican party to speak of. Reading propositions in one’s native language is essential. They’re hard enough to understand without having to translate! And why shouldn’t Spanish be a legitimate ballot language? The rest of us in CA should be learning to speak it – not complaining about it. English only? No way. I will never understand why non-whites don’t vote every single time. I read this morning that the Black & Hispanic turnout is going to affect the races in 10 states. I’ll stay out of the language debate but will challenge you on the need to read the propositions. I’ll be less than 100 people in the ENTIRE state actually read the propositions. So, your theory is they just decide on the basis of the ads or only read the name of the Prop? I suppose you’re right – but now I’m depressed.